I happen to have a similar "fake", which I got when a boy in the late 50's. It came with a trailer and a gun, that could actually fire. I remember scaring my mother firing burning matches with it through the living room! 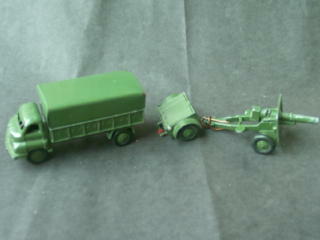 Now what's left is the reasonably intact Bedford and a damaged trailer and gun. 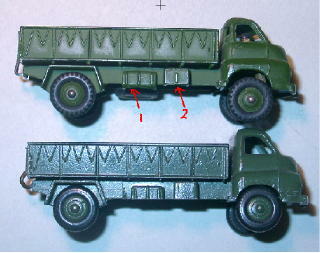 obvious differences: The colors and the finer lining, as well as the already mentioned grill shape. 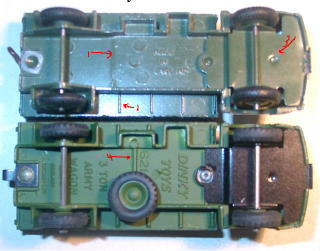 The left side shows bad workmanship on the moulding of the "fake" and the underside of the door on the Dinky. I have tracked the manufacture of this bedford to KEMLOWS OF LONDON. 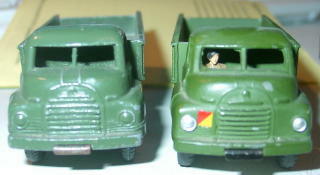 A nice bit of detective work, Dave, which will be of interest to everyone who's ever seen one of these diecast Bedford Army Trucks. I'm afraid I've never heard of Kemlow's. I think Christiaan is a bit unfair however in describing it as a "fake" Dinky. 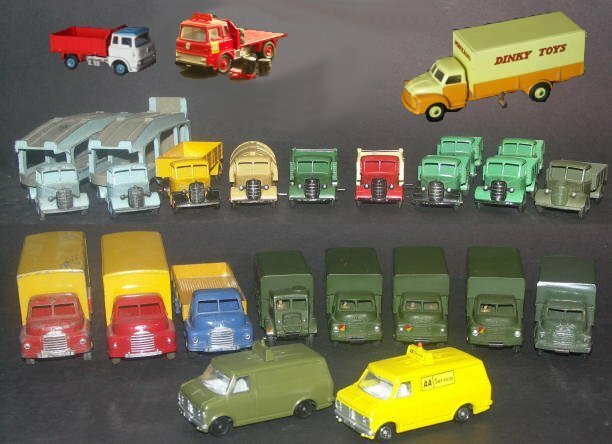 I'm sure the skilful pattern maker who created the first wooden mock-up and then the dies had no intention of producing an imitation Dinky. If he'd set out to copy the Dinky 621, he would have produced a closer replica. 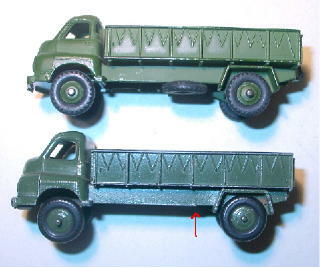 The toy company probably took their measurements from a real truck (or from Bedford drawings) just as Meccano did.